Following the cancellation of the JHCL game on Sunday the Oxfordshire Under 25s had a team building morning at Kidlington BC where they showed off their new kit. 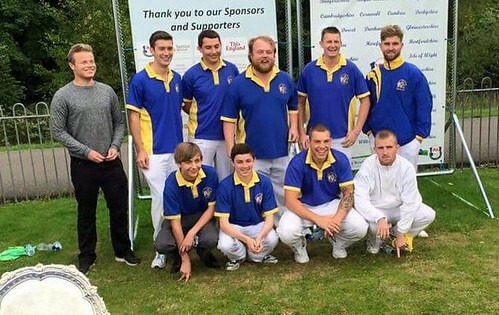 Oxfordshire Under 25s men kicked off the season at South Oxford BC on 6th May with a trial game against Wiltshire. This resulted in an overall win for Oxfordshire however the primary objective was for the team to get together on the green and start gelling again following the winter. This was achieved and followed up with a mixed get together and White Rose trial at Kidlington BC on 14th May. We presently have 34 junior players, male and female, in the county which is good, however that number will reduce by five at the end of the season and by at least two more in 2018. It is therefore imperative that we recruit further players to swell the ranks and build upon the successes of the past few seasons. As is my annual plea to all clubs, players and interested parties, please do all you can to recruit new bowlers of any age and in particular junior players, passing details to me regardless of age, experience or perceived ability. As I said in my end of season report, if we all introduce one new person to the sport this year we will be in a far healthier position as a county and as a sport! This is scheduled to be my last season as manager and so I seek support from anyone interested in taking over or at least assisting in the role. Please call or email me for a chat. Anyway, here’s to a great season for all in Oxfordshire. Look forward to seeing some of you at our junior games and many of you on the circuit. 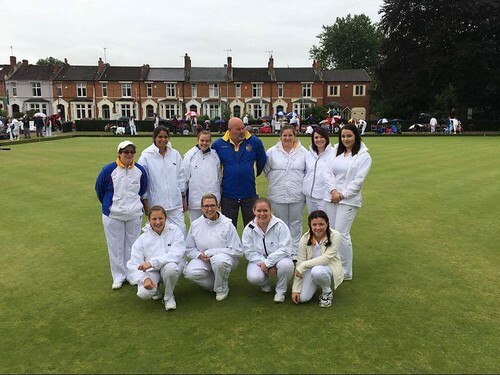 The previous day in appalling weather conditions, Bowls Oxfordshire Ladies’ Under 31s layed at Leamington in the Amy Rose Bowl double rink competition. Less experienced than the men’s junior team, the team progressed to the last sixteen in 2015 and hoped to match that achievement this time round. As the rain lashed down making playing conditions extremely difficult to say the least, the Oxford players captained by Banbury Central’s Helen Young, took the green against Northamptonshire. Both teams were hampered equally by the rain but the Oxon girls applied themselves brilliantly over the fifteen end game to win on both rinks with a final score of 25-17. Young skipped the first Oxon rink with Claire Soden, Katie Bland and Jody Flitter while the second four was skipped by Jazz Alder with Emma Gilkes, Victoria Nemar, making her first appearance for the county, and Katie Glenn. Individual rink scores are not available due to the scorecards having disintegrated! The win set up an Oxbridge last sixteen game which, after the morning’s performance, the BOL team were confident of doing well in, however a quarter final place for the first time was not to be with Cambridge running out winners by 27-13. In spite of the result the team played well and gained great experience. Next year there will be more competitive games for the girls in the build up to Leamington which is designed to increase experience, skills and team building as has happened with the boys over the past nine or so years. Again thankyou to all that braved the elements to support the girls in both games on Saturday. As with the boys it is much appreciated. Special thanks Emma Dickson and Zoe Pratley, the two reserves. Your attitude and support was exemplary and your time will come to play. All in all this was an excellent weekend for Oxfordshire’s young bowlers and one that will live long in the memory. The players now look to next season when they must all go a stage further in terms of personal and team development and success. Regardless of the excellent season for both teams, Oxfordshire still needs more players to give strength and depth to the squads. 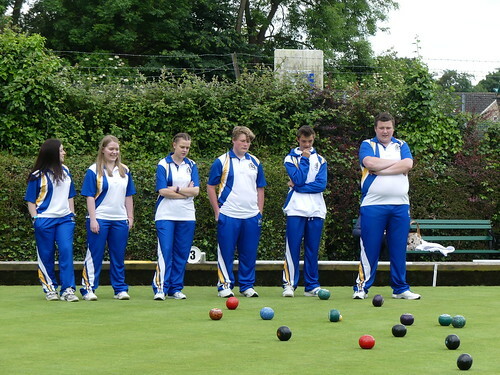 If anyone would like any information regarding junior bowls in the county please contact team manager Steve Gilkes at stevegilkes@btinternet.com or on 07868 435052. Oxon Under 25s beat the JHCL champions elect Buckinghamshire in a tight and exciting contest decided with the final bowl at Kidlington yesterday. With two rinks finished and Oxfordshire two shots to the good the game looked to have gone the way of the visitors when, with just Shane Cooper’s last bowl of the game to play, Bucks held four shots with an offset jack. The Watlington man duly stepped up to the mark however, and played a fantastic shot under the circumstances to trail the jack for four to Oxon and a six shot and 8-2 points win overall. In front of enthusiastic support for both teams Bucks had the better of the first half, with the Oxon rink of Cooper tied, Sam Watts’ four trailing by three and the luckless rink of Chris Gilkes eighteen adrift, and their confidence was high. The Oxford team though has gained massive experience from these type of games over the past few seasons and that showed as Gilkes and his men kept their heads and scored 11 shots to 5 in the second stage while Cooper and Watts steadily opened up what proved to be winning margins to set up the final end drama and the 60-54 victory. As we understand it, despite this setback, Bucks still secured the title by virtue of a Sussex win over Berkshire at Popes Mead. Our congratulations go to them. Previously, on 3rd July, Oxon travelled to Sussex and beat their hosts by 71 shots to 65 and 8 points to 2. Sam Watts 30, Jonathan Fenn-Tye 21. Oxon travel to Maidstone next Sunday, minus several key players, but still in a position to secure the runners up spot with a good win. At the same time yesterday there was a mixed friendly practice game between Oxon and Bucks involving seven of our Ladies Amy Rose team and three of the U25s reserves. It is hoped that this too, will become an annual fixture alongside the JHCL game. The next date for your diaries is the annual Under 25s Day at Watlington on Sunday 28th August. If, at any of your clubs, you have youngsters interested in playing regardless of experience or ability, please please get in touch with Steve Gilkes on 07868 435052 or stevegilkes@btinternet.com It is a day designed, not just for established players, but newcomers to have a fun introduction to the sport too. We need new players to start now, boys and girls, so please do all you can to get them along. Lunch, drink and a gift for all players is provided. Oxfordshire’s White Rose team lost out in the national semi-final against eventual winners Devon at Leamington on Sunday. Playing at this stage of the competition for the first time since 1991 and for only the second time ever, the Oxon players went into the game with belief in themselves and confident of a good performance but could unfortunately not reproduce great form of the four qualifying rounds and eventually went down by 13 shots (29-42). Devon went on to beat Northants in the final to complete the men’s hatrick of Middleton Cup, Balcomb Trophy and White Rose. 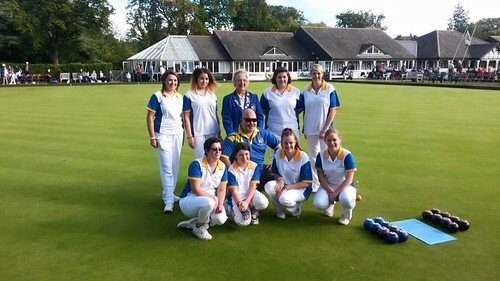 The previous day, Oxfordshire’s Under 31s ladies played Leicestershire in the Amy Rose and in a tense finish won on the extra end having been involved in a game that swung both ways as it progressed. The final score was 47-46. Emma Dickson of Woodstock made her debut in the competition having been reserve for the past couple of years. In the quarter-final the girls came up against strong opposition in the form of Somerset and despite being within two shots at one stage could not take the lead and eventually lost 30-48. Both men’s and ladies teams can be justly proud of their achievements this season and have represented the county in very positive fashion. 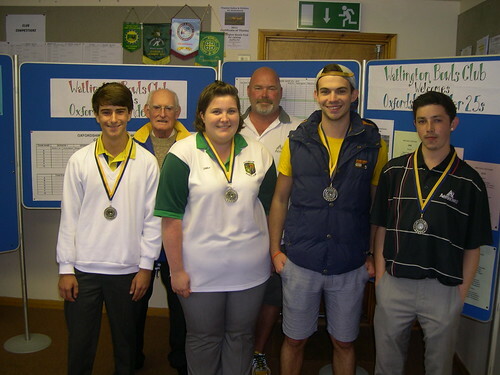 To round off the bank holiday weekend of junior bowls, Watlington BC hosted the eighth Under 25s Day on Monday, The weather conditions were not favourable but, as is normal for this event, players, organisers and supporters alike all got on with it and had another thoroughly enjoyable day. Six teams competed in a day long round robin with the longest ever Bowl for Goal competition at lunchtime (won by Thame’s Graham Penn with 4 goals out of 4…a first!). Luke Gilbert from Banbury Central, Ollie John of Woodstock and Chipping Norton’s David Leighfield all played in the day for the first time with Luke and David both taking home medals. Luke and Ollie are new bowlers while David has joined us from Wiltshire. The competition was eventually won by a four skipped by Joe Woodward with Ryan Full, Emma Gilkes and Jonathan Dadson. Second were Shane Cooper, Jazz Alder, Luke Gilbert and Bradley Squires and third place went to David Leighfield, Will Soden, Claire Soden and Brandon King. Following the success of the raffle in 2010 a second ‘buy a square’ draw was started during the day to again raise funds for shirts, equipment and events for the Under 25s and to aid in keeping costs down for players and their parents. The draw will be made during next year’s event. First prize is a set of AeroBowls. If anyone (or club) would like to purchase a square or squares for £1.00 each, please contact Steve Gilkes. Sadly the weekend also saw the end of six players’ Under 25s careers. Ryan Full, Dean May, Gary May, George Schwab, Dan Wakeman and Joe Woodward all move on through age.